I almost titled this post "How to Win Friends and Influence People," but that was already taken. Seriously, if you want to get a crowd of people to like you or shower you with praise and thanks, hand them this cobbler (warm), a pint of vanilla ice cream, and some forks, and stand back and let the magic happen. But not before you take some for yourself. I made this cobbler with the berries we had picked earlier that day, and fed it to a bunch of generous friends who are always willing to consume my baking experiments. Thanks, guys! America's Test Kitchen for the win, once again. Whisk cornstarch and sugar together in a large bowl. Add rinsed berries, lemon juice, and cinnamon and toss to coat. 1. Adjust an oven rack to the middle position and preheat oven to 400 degrees. Transfer the blueberry filling to a 9-inch round deep-dish pie plate, cover with foil, and set on a foil-lined baking sheet (for easy cleanup). Line a second baking sheet with parchment paper. 2. Whisk the flour, 1/4 c. of the sugar, baking powder, baking soda, and salt together in a large bowl. In a medium bowl, stir the chilled buttermilk and melted butter together until the butter forms small clumps. Stir the buttermilk mixture into the flour mixture with a rubber spatula until just incorporated and the dough pulls away from the sides of the bowl. 3. Using a greased 1/4 c. measure, scoop out and drop 8 mounds of dough onto the parchment-lined baking sheet, spaced about 1 1/2 inches apart. Toss the remaining 2 tsp. sugar with the cinnamon and sprinkle the cinnamon sugar over the biscuit tops. Do not let the batter sit for more than 5 minutes before baking. Bake the biscuits until puffed and lightly browned on the bottom, about 10 minutes. 4. 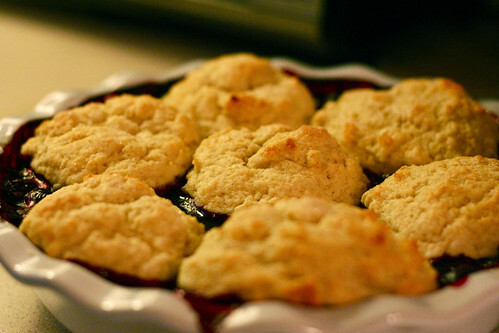 Remove the biscuits from the oven and set aside. Place the fruit in the oven and bake until hot and has released its juices, 20-25 minutes. 5. Remove the fruit from the oven, uncover, and stir gently. Arrange the biscuits over the top, squeezing as needed to fit into the dish (Amy's note: I tried my darndest but could only fit 7). Place cobbler back onto the foil-lined baking sheet and bake until the biscuits are golden brown and the fruit is bubbling, about 15 minutes, rotating the dish halfway through baking. Let cool for 10 minutes before serving with vanilla ice cream. Your blueberry cobbler looks amazing! Oh man I could so go for this with a dollop of vanilla ice cream. Delicious! wow, this recipe looks soooooooo good! Yum! 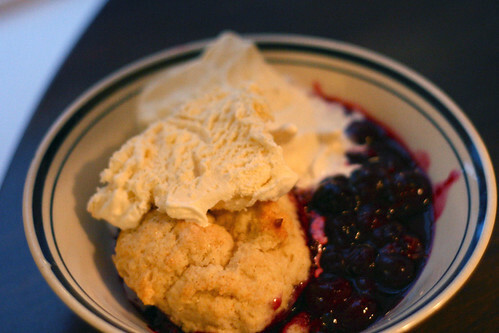 I just made this cobbler a couple weeks ago, and it was delicious. ATK has never steered me wrong!